In a 21-year major league career with seven teams (Chicago Cubs, San Diego, Detroit, Atlanta, Houston, New York Yankees, Minnesota), Niekro posted a 220-203 record, including back-to-back 20-win seasons in 1979 and 1980 for the Houston Astros, for whom he played 10 years. In the 1980 league championship, Niekro hurled 10 innings of shutout ball against Philadelphia. Employing the knuckler they learned from their father, Joe and his brother Phil (NPASHF 1990 inductee) combined for 539 victories, more than any other brother combination in professional baseball history. In games they pitched against each other, Joe has a 5-4 advantage. In addition, the only home run Joe ever hit in the majors came against Phil in 1979. Many fans think of him as Phil Niekro’s little brother. Others remember him for the incident in which he was suspended for carrying an emery board in his back pocket. The fact is that Joe Niekro was one of the most durable and productive pitchers in major league baseball history. 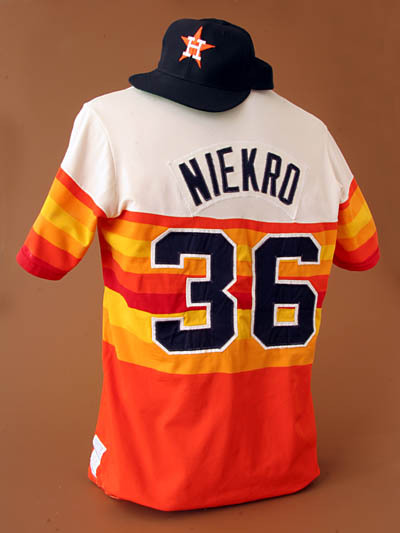 During his 21-year career, Joe Niekro played for seven major league teams, posting a 220-203 lifetime record. One of relatively few big league pitchers to be productive into their 40s, Joe is also among the rare hurlers who have been successful with both a conventional pitching style as well as using the tricky knuckleball. He combined with brother Phil for 539 career wins, a major league record that may never be broken. Joe’s parents, Henrietta “Ivy” and Phil Niekro, Sr., were children of Polish immigrants who settled in the coal mining region along the Ohio River. Joe’s father was an outstanding pitcher who learned how to throw the knuckleball after an arm injury. Joe and brother Phil, nearly five years his senior, learned the knuckleball pitch from their father. They vividly remember sitting in the driveway with their gloves, waiting for dad to come home from the coal mines. Black with coal dust, the elder Niekro would put down his lunch bucket and play catch with his sons. Sometimes their father would get so tired that he’d fall asleep on the floor but “He always had time for us,” recalled Phil, Jr.
After graduating from Bridgeport High School, Joe attended West Liberty College in West Virginia, where he was a baseball All-American. Joe started in the majors with the Chicago Cubs in 1967, winning 10 games. Joe went 14-10 in 1968, but was traded to San Diego the following year. In 1970 he was dealt to Detroit, where he posted a 21-22 record in three years. Joe was considered to have a much better arm than Phil and, unlike his brother, was primarily a fastball-curveball-slider pitcher when he first made it to the majors. After enjoying some early success, the 6’1″, 190-lb. right-hander seemed to lose some of his velocity. Joe was placed on waivers by Detroit in 1973 and was picked up by Atlanta, joining his brother Phil. But Joe saw little action with the Braves, and in 1975 the team wanted to send him down to the minors. When Joe refused the demotion, his rights were sold to the Houston Astros. By the time he got to the Astros, Joe had been convinced by Phil to rely primarily on the knuckleball. However, Joe used a different grip than his older brother, and tended to throw faster as well. The results were spectacular, as Joe soon became Houston’s most consistent pitcher. He earned a berth on the All-Star team in 1979, finishing with a 21-11 record. Joe went 20-12 in 1980, becoming the first pitcher in franchise history to post back-to-back 20-win seasons. Probably his most memorable game occurred in the 1980 National League Championship Series against Philadelphia, when Niekro hurled 10 innings of shutout ball. In 1985, Joe was traded to the New York Yankees. He was able to watch from the dugout as 46-year-old Phil notched his 300th career win in the last game of the year. Despite the fact that Phil won 16 games with a 3.09 ERA for the Yankees in 1985, he was released the following spring. A deeply disappointed Joe Niekro played for New York in 1986, but was traded to Minnesota in June of 1987. At the time he had the second lowest ERA (3.55) of any of the starters on the Yankee staff. The bizarre “Emery Board Incident” thrust the low-key Niekro into the national spotlight in 1987. While on the mound against California, Joe was suddenly asked to empty his pockets by the umpire. Out came an emery board and a piece of sandpaper. Joe argued that the materials were used to prepare his fingers to pitch, not to alter the ball, and that he carried them in his pocket for years. The league also suspended him for 10 days. He considered making a formal appeal, but decided not to risk a delayed suspension that would cause him to miss post-season play. Joe was genuinely offended that he was accused of cheating, but he took the affair in mostly good humor. Brother Phil helped add to the levity by sending his little brother a power sander with a 50-ft. extension cord. Joe even appeared on the David Letterman Show to joke about the incident. Not so humorous was a shoulder injury, caused by Joe’s involvement in an on-field brawl. The injury and the suspension caused Joe to finish the year with his worst record (7-13, 5.33 ERA) since 1969. In October, Joe became the first Niekro to appear in a World Series, as the Twins faced off against St. Louis in the fall classic. Joe saw action in relief during game four in Minneapolis. “When I went to the dugout for the start of the game and found out it was unofficially ‘Polish Night,’ with Stan Musial and Moe Drabowsky throwing out the first balls-and you in the stands-I had a feeling that maybe this was supposed to be the night a Niekro pitches in the World Series,” wrote Joe to brother Phil. The following May, the 43-year-old Niekro was released by Minnesota and joined Phil in retirement. The Niekros ended their major league service with 539 wins, a record for a brother combination that will likely stand for generations. Joe later served on the coaching staff of the Twins and Colorado Rockies. The knuckleball is a strange pitch that few major league pitchers have been able to master. A good knuckleball travels erratically without rotation, causing problems for most hitters and catchers alike. The pitcher actually digs his fingernails, not his knuckles, into the ball, though the actual technique varies widely among practitioners. The Niekros first faced each other on July 20, 1974, with Phil earning a 5-4 victory. In games they have pitched against each other, Joe has a 5-4 advantage. In addition, the only home run Joe ever hit during his major league career came in 1979 against Phil.